Celtic are now tantalisingly close to completing an astonishing ‘treble treble’ after sweeping aside an imploding Aberdeen side to secure their place in next month’s Scottish Cup Final against Hearts. Neil Lennon’s prospects of upgrading his interim management status to a longer term second spell in charge of Celtic surely received a significant boost as goals from James Forrest, Odsonne Edouard and Tom Rogic kept him firmly on course to complete the job started by Brendan Rodgers. For Derek McInnes, it was another unhappy afternoon at Hampden. The Aberdeen manager saw his team reduced to nine men with the dismissals of Dominic Ball and Lewis Ferguson, while he and his assistant Tony Docherty were both sent to the stand by referee Craig Thomson. McInnes was punished for his reaction to sectarian chanting directed at him from a section of the Celtic support, the depressing recent trend of such incidents sadly adding a sour note to an otherwise memorable day for the cup holders. 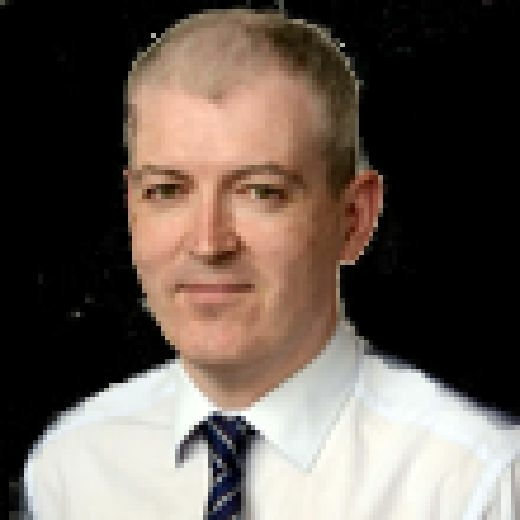 On a day when many observers had fancied Aberdeen’s chances of finally halting the silverware-collecting juggernaut which Celtic have become over the past three seasons, the champions were clearly determined to remind everyone they have no intention of loosening their vice-like grip on any of the trophies they currently hold. They imposed their authority on the tie from the very start and Aberdeen had to ride their luck to avoid the concession of an early goal. Barely a minute was on the clock when Forrest and Edouard got in each other’s way as they tried to get on the end of a Callum McGregor cross, allowing Andrew Considine to slide in and make a saving challenge. Aberdeen appeared nervy and hesitant in those opening exchanges. In the fourth minute, Jozo Simunovic was allowed to charge through the middle without facing any meaningful resistance. 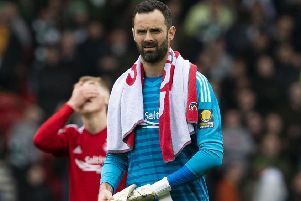 The big Celtic defender found himself on the edge of the Dons penalty area and his low left foot shot forcefd a fine save from Joe Lewis who got down to turn the ball behind. From the resulting corner kick, Simunovic was presented with another clear sight of goal and this time he wastefully shanked his effort wide from close range. 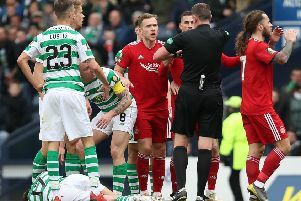 On what would prove a demanding afternoon for referee Thomson, he opted to take no action at the first flare-up in proceedings when Edouard and Ferguson clashed angrily off the ball. But he produced his yellow card for the first time shortly afterwards when he sanctioned Forrest for simulation after the winger threw himself to the deck dramatically after the slightest of touches on him from Considine on the edge of the penalty area. Ball then collected his first fateful booking in the 26th minute for a clumsy foul on Jonny Hayes who was again preferred to Scott Sinclair in the Celtic starting line-up. While McGregor fired a shot just over after being set up by Edouard, the early vibrancy and tempo of Celtic’s play had dipped a little. Aberdeen gradually made themselves known as an attacking force and top scorer Sam Cosgrove volleyed just wide of Scott Bain’s right hand post after getting on the end of a Ball cross. But Aberdeen’s attempts to gather some momentum suffered a major setback with Ball’s departure in the 37th minute. Despite his protests, the on-loan Rotherham player had no credible case for complaint. Any claims over a lack of intent were negated by the reckless and dangerous nature of Ball’s aerial challenge on Ryan Christie which left the Celtic playmaker stricken and in need of lengthy treatment before he was carried off on a stretcher. Tom Rogic replaced Christie, while Aberdeen withdrew Stevie May and sent on an extra defender in Mikey Devlin as they reorganised with 10 men. When play finally resumed, the short-handed Dons actually threatened first when Ferguson headed wide from a Greg Stewart cross. But in the second of six additional minutes allotted at the end of the first half, Celtic made their fully deserved breakthrough. It was another moment of big occasion magic from Forrest as he collected a short pass from McGregor before turning away from the hopelessly wrong-footed Max Lowe and guiding a brilliant left foot shot beyond Lewis from around 25 yards. McInnes waited to confront Thomson after the half-time whistle before he was ushered up the tunnel by the referee. It later emerged Docherty was sent to the stand for comments he made to the match officials as they made their way to the dressing rooms. Any prospect of Aberdeen mounting an unlikely salvage operation disappeared completely as their afternoon fell into even greater disarray within a five minute spell midway through the second half. Celtic doubled their lead from the penalty spot in the 62nd minute after Devlin got caught on the wrong side of Hayes. The winger went down under what was the lightest of touches from Devlin but although it was a soft award, it was correct. Edouard made an emphatic job of converting from 12 yards, Lewis unable to keep out the striker’s venomous effort despite diving the right way. Five minutes later, Aberdeen found themselves down to nine men. It was a simple decision for Thomson to make, the referee going straight to his top pocket for the red card after Ferguson lunged in on Rogic with raised studs. From the subsequent free-kick, Celtic made it 3-0. Mikael Lustig’s effort was blocked but the Swede collected the loose ball and rolled a pass to Rogic who steered a left foot shot beyond Lewis’s left hand from around 20 yards.